Chalmor’s Controls for Storage Water Heaters can Save YOU Energy! Home Energy Savings Chalmor’s Controls for Storage Water Heaters can Save YOU Energy! Move Master is a retrofit product which we can install which schedules your water heater to come on and turn off on a needs basis, dramatically reducing the amount of energy used. Currently, we have undertaken a few projects using the Move Master, and the results have been extremely positive. Clearly, the table shows that the Move Master tea boiler controls are maximising savings on any days where the office is not used. 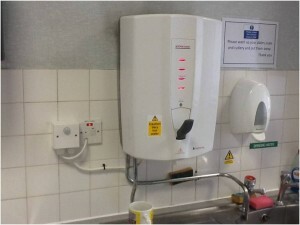 In one of our past projects, the Move Master control automatically achieved high savings by switching on water heaters in the morning only, as and when the office was occupied. If staff members were going start later in the day, the water heater would switch on accordingly. This not only produced high levels of energy saving, but it also saved our client money. It must be noted that not every tea boiler project that we carry out will produce the same savings, as they are dependent on a number of different variables. To find out how we can help you make savings on your tea boiler/storage water heater, email us at marketing@chalmor.co.uk, or call us on 01582 784700.